How to convert your PDF files into JPG raises and equally significant and logical question - why do we need to change a file from PDF to JPG in the first place? Technically, a PDF or Portable Document Format, created by Adobe Systems in 1993, is an open source format for document exchange. It is used for representing two dimensional documents in a manner independent of application software, hardware, and operating system. JPG or Joint Photographic Experts Group is used for lossy compression for photographic images. While a PDF file uses an external application - Adobe Acrobat Reader to open up files, JPG utilizes the inbuilt software, hardware, and operating system in your pc to open files in a compatible way. Now, there’s no need for you to turn virtual and enter your pc with a pair of scissors to chop off those images out of that PDF file and bring them back into the real world so that you can use them in a non-irritating and compatible way. There are easy ways to do that and yet staying human. Read on about how to convert PDF files to JPG. You can use the tools of Adobe acrobat reader against it. If you have an Adobe acrobat reader and still want to convert a PDF to JPG file, for whatever reason, open up the document in PDF. Click tools, select the snapshot/screenshot cursor and click and drag the cursor on the page for whatever area you want to be converted into JPG or the full page if need be. After you release the click, the whole page or the selected area will go black. Don’t fret as it just means that the area has been snapped and now you just need to paste it on your desktop and it will automatically take the form of a JPG file. Another way of converting PDF into JPG is by using your keyboard for a change. Open up the file in adobe acrobat reader, press the “prnt scrn sys rq” key on your pc and your whole screen will automatically be copied. Now open the paint program and paste the document on it. Crop and resize if needed, and then save the document as jpg. With online converters like “zamzar”, “you convert it”, and “neevia document converter”, you can easily convert the whole file (all pages) from PDF to JPG within a minute. The best thing about these online converters is that you don’t have to download and install any software on to your pc for file conversion. Having a valid e-mail account is the only requirement that you have to fulfill. Upload your file and e-mail address to these websites, chose your output format as JPG file and receive it in your mail within seconds. Only limitation to this method is, you can only convert up to a certain number of files and that too within a certain megabyte limit. 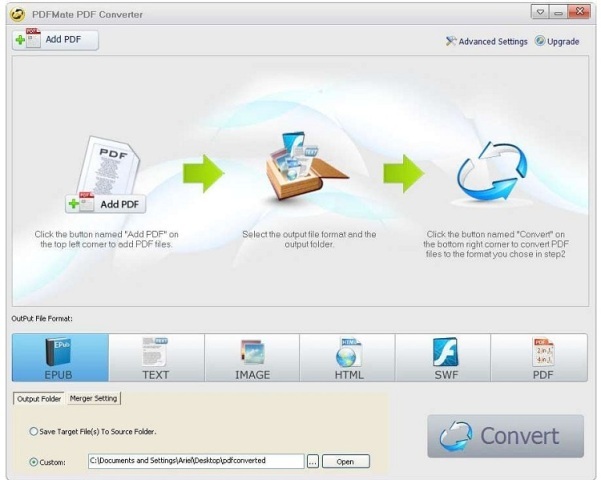 There’re many freeware and shareware converters like “PDF-Xchange viewer“, “Omniformat”, and “Virtual Image Printer Driver”, available to be downloaded and installed. While you have no restrictions in the freeware versions as to how many files you can convert, in shareware versions you could either convert a given number of files or as many files as you want but for a limited period (trial period, and then you have to purchase), generally 30 days. Converting PDF to JPG is not an uphill battle, but a piece of cake. With these ways, you can convert a PDF to JPG, without wanting to rip your arm off.